Captain EO is dead, and I don't feel so good myself. He made us dream of a world in three dimensions. We must find the strength to move forward. As an aside, let me just say that Celebrity Cull 2009 has outdone itself, though I have to ask if a freak accident that manages to take out Paris Hilton, Rob Schneider and Martin Lawrence would be too much to ask. And, I paraphrase myself...does anybody else, when they hear the phrase "freak accident" think of something along the lines of Andre the Giant driving a transfer truck cab running down Michael Jackson riding a tricycle? I had a dream last night that I was visiting Elvis at Graceland. I think this was brought on by Tivo having captured Blue Hawaii and Clambake both within the past couple of weeks. I'm not sure which keywords my Tivo has tripped that would end up with a couple of Elvis's movies in my suggestions, but I ended up watching both, having seen Blue Hawaii last years ago, and never having seen Clambake. Elvis was pretty cool, though I never saw him much. Very gracious, as I ended up having pretty much run of the house, which I visited in "real life" probably twenty years ago. In the dream, the house was an amalgamation of the real life experience. I remember crazy shag carpeting on walls, rooms with multiple televisions, and getting to step up onto Elvis's tour bus. My subconscious substituted other elements, like the Biltmore house over in Asheville...in my dream Elvis had a large empty swimming pool 20 feet deep (for some reason, this has been the over-riding image I've held since visiting that mansion three or four times now over my 32 years. Elvis also had a skate ramp and a room filled with pinball machines, a'la Bam Margera's home from Viva la Bam. Well, free run of the house didn't end well. At one point, I wander down a staircase, and find the ceiling just raining water. Even for a dude as awesome as Elvis, he seemed a little out of sorts for it to be raining inside the house. The culprit? A refrigerator door that would not shut. Apparently, when the refrigerator door does not shut, it floods hundreds of gallons of water inside the house of the King of Rock n' Roll. Not an interesting story, so much. Just wanted to write it down before I forgot. Kinda dug the dream. Fight Club came out 10 years ago?!?!?!?!?!?!?! I think it came out roughly two weeks before my last post. Don't know why no posting. It caters too much to my attention deficit whatthehellever. One day, I'll be able to write a full paragraph again. Yeah. Usually I hate pictures of people meeting celebrities. But, unexpectedly, I had one of those tripping over my tongue moments meeting a guy who pretends to fight for a living. The problem with having to wake up at 5:10 every day for a week and a half is that my brain wakes up then on its own, come my first weekend off in five weeks or so. I'm out of the monthly comic game, and have been for a year and a half, now. And truth be told, I'd been doing it out of little more than force of habit for a couple years prior to that. I felt like after 20 or 25 years of comics, I wasn't getting the enjoyment out of reading (or spending a grand a year) on comics that maybe I once had. Still, I'll still pick up a collection or two. I'm not up on current storylines, but I did find a new Astro City collection at the used bookstore a month ago, and I dig The Walking Dead, too. Anyway, wandering up to Knoxville today. 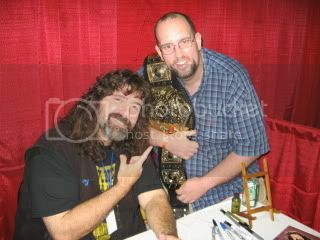 Don't know how much I'll get into comics, but I figure I'll get Mick Foley to sign a book. Also? I'll get to meet Gary Coleman. Life may be pretty much complete. Wandered down to Chattaboogie last night to see Willie Nelson headline the first night of the Riverbend get-together. It was a good show, enjoyable, with the weather for the first weekend in June probably the nicest I can recall in years. There is a joke that God knows when Riverbend is scheduled, and that's when he decides to plug the heat in. But I don't know that it got above 80 for the day, and around the time Willie played, we were hovering in the mid 60's. His set wasn't much different from the last time I saw him...in pretty close to the same venue...he played Bellsouth Park with Bob Dylan. AT&T Field (formerly Bellsouth Park) sat over my left shoulder, at Ross's Landing. The crowd seemed pretty subdued. Though I want to take a second to take issue with the fact that it seemed like half the crowd decided to leave in the middle of Willie's set. I recognize that Riverbend's kind of a community get together, and that a lot of people come more to people watch or to be people that get watched. But still, it seemed like leaving a ballgame in the fifth inning. How do you leave before Willie sings On the Road Again? Yeah. I can't condemn without admitting in the interest of full disclosure that I've dropped dogs into ponds, and had them react like I'd just played the most incredible game in all of canine history. But there's an instant karma attached to the whole "kicking" action, I think. "You know who else quit? That chick is the Hitler of our day." Indeed. The quotable Jason Davenport.